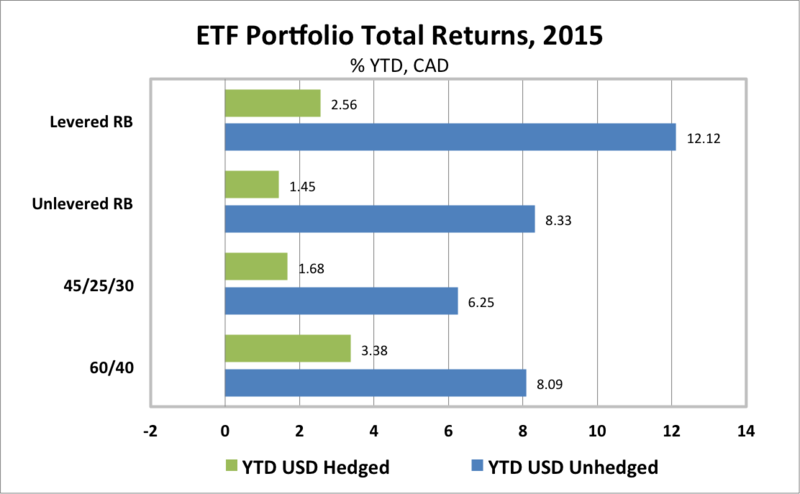 Global ETF portfolios for Canadian investors continued their stellar performance in the first quarter of 2015. Most of the strong performance was attributable to a further 8.4% depreciation of the Canadian dollar relative to the USD that provided a profitable tailwind for Canadian investors in USD denominated global ETFs. Global growth and global inflation were both significantly weaker than expected in 1Q15. Nine of the eleven large economies that I track have had their 2015 growth forecasts revised down since the beginning of the year. The exceptions are the Eurozone, where the growth forecast has barely edged up, and India, which has been a legitimate positive surprise. Russia and Brazil are contracting. China is slowing, probably by more than the official statistics. Nine of the eleven large economies that I track have had their 2015 inflation forecasts revised down. The exceptions are Brazil and Russia, where large exchange rate depreciations are pushing inflation higher. Led by crude oil, commodity prices continued to decline in 1Q15, putting further downward pressure on the currencies of commodity exporting countries, including Canada. Global central bank policies diverged. The US Fed continued to prepare markets for an increase in the policy rate in 2015. The BoJ pursued and the ECB initiated aggressive quantitative easing. Other central banks, including the BoC and the PBoC, responded to weakening growth, plunging oil prices and falling inflation by cutting their policy rates. Russia and Brazil were forced to hike policy rates to support their currencies. Bond yields fell virtually everywhere, again with the exception of the distressed economies. From my perspective, a key development for markets was that, despite much weaker than expected US economic growth and inflation in 1Q15, the Fed continued to stress the need for "policy normalization". At the March FOMC meeting, the Fed dropped the use of the word "patience" form its policy guidance and Fed Chair Janet Yellen indicated that this meant that the policy rate would likely rise later in 2015. Importantly, the Fed signalled that the normalization of rates would be gradual and dependent on incoming economic data. This note of caution took some of the steam out of the US dollar appreciation, but only pushed back analysts expectations of the timing of the first rate hike by a few months at most. For its part, the Bank of Canada surprised most observers by cutting its policy rate by 25 basis points to 0.75% in January. The Canadian dollar (CAD) depreciation versus the USD accelerated following the BoC move. Many observers criticized the BoC for not signalling the rate cut more clearly, but as the quarter ended, it appeared that the BoC's concerns, that the plunge in crude oil prices would produce a sharp negative shock to both growth and inflation, were well founded. In 1Q15, with the USD appreciating 9.2% against the CAD, the best global ETF returns for Canadian investors were in Japanese and Eurozone equity ETFs. Despite the weakening of their currencies, the two equity markets where central banks pursued the most aggressive monetary stimulus posted the strongest global returns. The worst returns were in commodities. The chart below shows 1Q15 returns, including reinvested dividends, for the ETFs tracked in this blog, in both local currency terms (i.e. USD terms for the global ETFs) and in CAD terms. 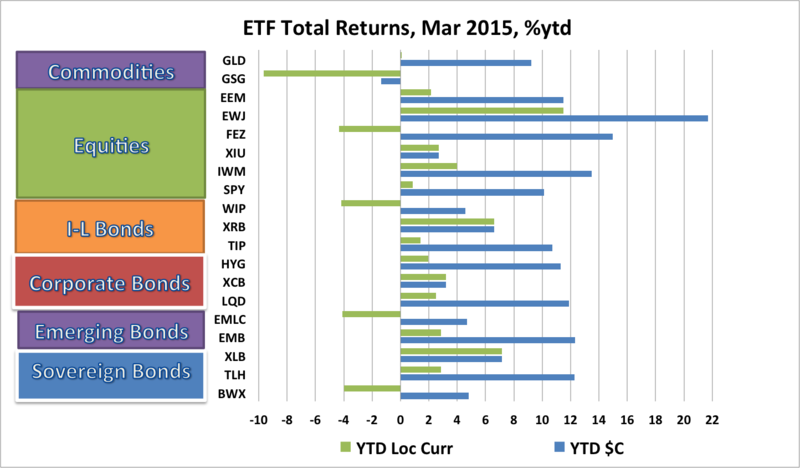 In local currency terms, 14 of the 19 ETFs posted positive returns, while 5 ETFs posted losses. In CAD terms, 18 of 19 ETFs posted gains, while just 1 posted a loss. The best gains were in the Japanese equity ETF (EWJ) which returned a stunning 21.7% in CAD. The Eurozone equity ETF (FEZ) was second best, returning 15.0% in CAD. Other strong gainers included US Small Cap equities (IWM), which returned 13.5% in CAD; USD-denominated Emerging Market bonds (EMB) 12.3%; US Long Bonds (TLH) 12.3%; US Investment Grade bonds (LQD) 11.9%; Emerging Market equities (EEM) 11.5%; US High Yield bonds (HYG) 11.3%; US Inflation-linked bonds (TIP) 10.7%; and US Large Cap equities (SPY) 10.1%. Canadian assets underperformed global ETFs in 1Q15. The Long Bond ETF (XLB) returned 7.2%; the Real Return bond (XRB) 6.6%; the Corporate bond (XCB) 3.2%; and Canadian equities (XIU) 2.7%. The worst performer, by far, was the commodity ETF (GSG), which returned -1.4% in CAD. The Gold ETF (GLD) fared better with a virtually zero return in USD but a 9.2% return in CAD terms. In 1Q15, the Canadian ETF portfolios tracked in this blog posted strong returns in CAD terms when USD currency exposure was left unhedged, but only moderate returns when USD exposure was hedged. In a November post we explained why we prefer to leave USD currency exposure unhedged in our ETF portfolios. The traditional Canadian 60% Equity/40% Bond ETF Portfolio gained 8.1% in CAD when USD exposure was left unhedged, but just 3.4% if the USD exposure was hedged. A less volatile portfolio for cautious investors, the 45/25/30, comprised of 45% global equities, 25% government and corporate bonds and 30% cash, gained 6.3% if unhedged, but just 1.7% if USD hedged. Risk balanced portfolios outperformed in 1Q15, continuing the trend established in 2014. A Levered Global Risk Balanced (RB) Portfolio, which uses leverage to balance the expected risk contribution from the Global Market ETFs, gained a robust 12.1% in CAD terms if USD-unhedged, but had a less stellar gain of 2.6% if USD-hedged. An Unlevered Global Risk Balanced (RB) Portfolio, which has less exposure to government bonds, ILBs and commodities but more exposure to corporate credit, returned 8.3% if USD-unhedged, but just 1.5% if USD-hedged. The robust performance, in Canadian dollar terms, of the unhedged global ETF portfolios has been driven largely by the strength of the USD versus CAD. The twin causes of the CAD weakness have been the plunge in commodity prices, led by crude oil which is Canada's largest export, and the divergence and Fed and BoC policy. It is an interesting question as to whether these trends will continue. Crude oil inventories are at record levels and oil production continues to run ahead of demand. Many analysts expect crude oil prices to fall further in 2Q15. Fed and BoC policy divergence has accelerated the weakening of CAD. In both countries, 1Q15 growth and inflation have fallen short of expectations. While the Fed has so far remained steadfast that policy rate normalization will begin later this year, the BoC has responded to a huge negative terms of trade shock (appropriately in my view) by cutting its policy rate. The US economy appears better positioned than Canada for a 2Q15 rebound, but the soft US employment report for March suggests caution. If growth disappoints in both countries as 2Q unfolds, however, it is likely that the Fed response will just be to delay tightening, while the BoC response will be to cut rates again. In this environment, maintaining unhedged exposure to global ETFs remains my preferred portfolio stance. While the more conservative 45/25/30 portfolio (which I have favoured) under performed the more aggressive ETF portfolios, we can hardly be dissatisfied with a year-to-date return of 6.3%. As we enter 2Q15 in a continuing uncertain environment, characterized by significant global divergences in growth and central bank policies, and with rich valuations for both US equities and bonds, remaining well diversified with an ample cash position continues to be a prudent strategy.